Capt. Moore set the stage for understanding the extent of plastics in the complexity of the ocean environment, by pointing out that plastic is ubiquitous in our society -- but we do not understand it. Its additives are unknown, as are its impacts. Be prepared for a wonderful yet sobering presentation with excellent slides. Today Santa Cruz, California, joined the rising number of cities banning disposable plastic shopping bags. While there is progress in the awareness required to deal with the toxic petroleum product we have surrounded ourselves with, the health consequences are just beginning to be known. Health food stores sell many a plastic product such as packaging containing the endocrine disruptor bisphenol-A. From such a store yesterday I bought vegetable plants -- "starts" -- in little plastic containers, and put them in some newly composted beds yesterday. Then someone watered them straight out of a hose that had water sitting in the phthalate-rich (more endocrine disruptors) plastic hose. What kind of a choice is it to run the water first, polluting some ground that "doesn't matter," before watering plants that we want to be healthy and safe to eat? Charles Moore has pointed out the insurmountable challenges of trying to recycle our way out of the plastic mess or trying to collect the plastic trash out of the ocean. As he points out, we have to cease the onslaught into our oceans. Deservedly, Moore packed the theater at the Aquarium of the Pacific, and afterwards outside, as I played some eco-songs on my guitar in the lobby, he sold out all the copies of his book that the Aquarium store had on hand. The long line of book buyers were clearly galvanized to learn more and change their ways. 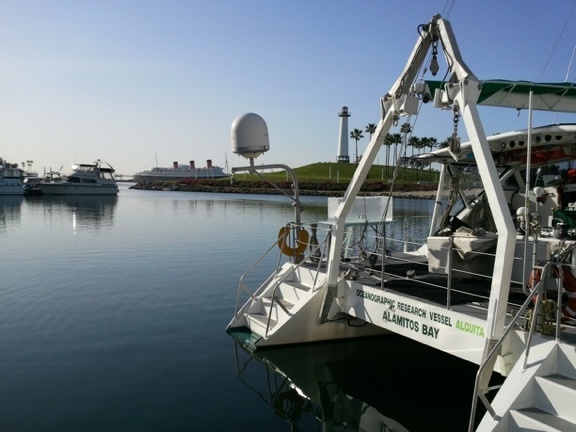 To cap off a great evening the Captain and I repaired to the ORV Alguita, and brought her the next day from the Aquarium near the Queen Mary south to the catamaran's home slip. Capt. Moore at podium. Video courtesy Encore Video Services, Huntington Beach, Calif.
For more information on Capt. Moore's work, visit the website of the Algalita Marine Research Foundation, which he started prior to his discovering the Northern Pacific Garbage Patch in 1997. Get his book Plastic Ocean, and read articles on the plastic plague in Culture Change. For video jobs of high quality, such as the new one on Captain Moore's work featured here, (produced pro-bono for Culture Change and Algalita), retain Encore Video Services, headquartered in Huntington Beach, California. Ask for owner David Nathenson.